Medical billing specialists are part of a hospitals medical records and health information technician team. They use patient records to compile and submit claims to their health insurance companies for reimbursement. Thus, medical billing professionals make sure that doctors and other healthcare practitioners are paid for the services they provide and the business of healthcare delivery continues without interruption. In doing so, they act as a liaison between healthcare providers and their patients insurance carriers. There are several medical billing schools that offer training to aspirants to this profession, but choosing the right one requires some amount of research. Accreditation is important if the school offers degrees as it allows for transfer between colleges and universities. However, it may not be as important if you are attending a vocational training school to study medical billing. Check if the curriculum of the program at such a school is approved by industry specific organizations and if it is, you are good to go. You can also ask the school about information regarding their placement history to put yourself at ease about the employability of its alumni. Should the school be reputable? Reputation is something a school builds over years by offering quality education. Make sure your medical billing school enjoys a good name in the market. Surf the Internet for reviews and student testimonials; check with medical billing professionals how its perceived in the industry; and try to find out the kind of business associations it has -- thats usually a good indicator of the kind of respect it commands. Whether you want to study on campus or take classes online is a personal choice based on a variety of factors. If you are a stay at home mom, for example, it may be easier for you to pursue an online medical billing course as opposed to attending physical classes. A lot of online programs are also self-paced, which means you can complete your course anytime within a specific period. Its important to check the curriculum of the medical billing program at your chosen school to make sure they offer industry standard, relevant education. A medical billing program should ideally cover training in medical terminology, anatomy and physiology, billing software, healthcare reimbursement system, basic medical coding, legal and ethical issues in healthcare, etc. Should hands-on training be included? Hands-on training is an important component of any vocational or career course. It provides students industry experience and prepares them for whats to come. Practical experience provides students an opportunity to apply the skills they have learned through their coursework to complete real world projects and helps them make a smooth transition in to workforce. Does the school offer placement assistance? Placement assistance is an important service that a school offers its graduates. A medical billing school thats willing to walk the extra mile in ensuring that its graduates are able to turn their training into employment inspires confidence. So, dont hesitate to ask your chosen school about their placement services. While youre at it, it wont hurt to find out other student support services the school offers. What about medical billing certification? Your training program should ideally prepare you for medical billing certification. Organizations like the American Medical Billing Association (AMBA) offer nationally recognized certifications for medical billing specialists. Some schools may also offer its graduates membership to such organizations, thereby exposing them to plenty of opportunities to network with professionals from the industry, share knowledge and experience with them, and advance their careers through continuing education & research. 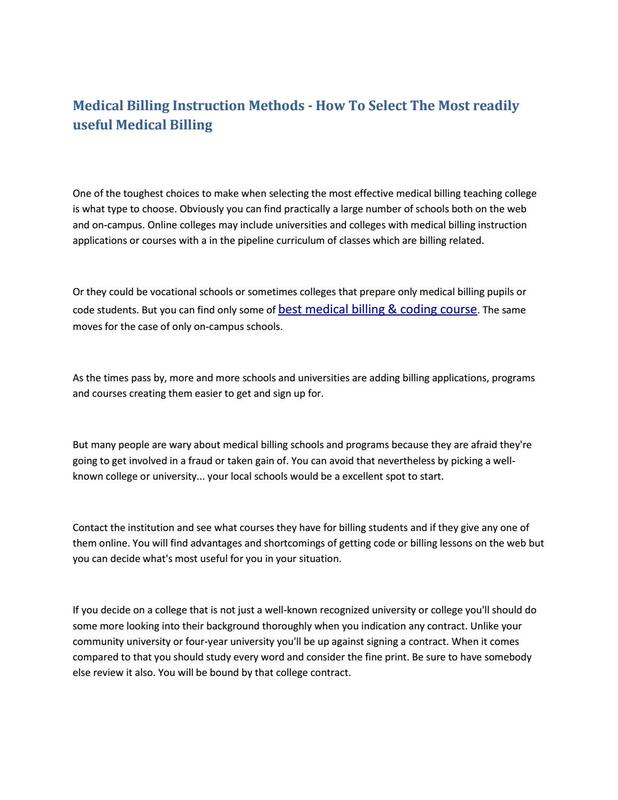 0 Response to "How To Choose A Medical Billing School"